The discovery of a ‘left-handed’ magnetic field that pervades the universe could help explain a long standing mystery – the absence of cosmic antimatter. Planets, stars, gas and dust are almost entirely made up of ‘normal’ matter of the kind we are familiar with on Earth. But theory predicts that there should be a similar amount of antimatter, like normal matter, but with the opposite charge. For example, an antielectron (called a positron) has the same mass as its conventional counterpart, but a positive rather than negative charge. In 2001 Vachaspati published theoretical models to try to solve this puzzle, which predict that the entire universe is filled with helical (screw-like) magnetic fields. He and his team were inspired to search for evidence of these fields in data from the NASA Fermi Gamma ray Space Telescope (FGST). Vachaspati has written extensively on cosmic strings, magnetic monopoles, black holes, and cosmological magnetic fields, and has authored the monograph “Kinks and Domain Walls: an introduction to classical and quantum solitons”. He was a Rosenbaum Fellow at the Isaac Newton Institute in Cambridge, a Member of the Institute for Advanced Study, Princeton, and is a Fellow of the American Physical Society. In 2015, a group of scientists, led by Vachaspati, with collaborators at the University of Washington and Nagoya University, announce their result in Monthly Notices of the Royal Astronomical Society. FGST, launched in 2008, observes gamma rays (electromagnetic radiation with a shorter wavelength than X-rays) from very distant sources, such as the supermassive black holes found in many large galaxies. The gamma rays are sensitive to effect of the magnetic field they travel through on their long journey to the Earth. If the field is helical, it will imprint a spiral pattern on the distribution of gamma rays. Vachaspati and his team see exactly this effect in the FGST data, allowing them to not only detect the magnetic field but also to measure its properties. The data shows not only a helical field, but also that there is an excess of left-handedness – a fundamental discovery that for the first time suggests the precise mechanism that led to the absence of antimatter. For example, mechanisms that occur nanoseconds after the Big Bang, when the Higgs field gave masses to all known particles, predict left-handed fields, while mechanisms based on interactions that occur even earlier predict right-handed fields. 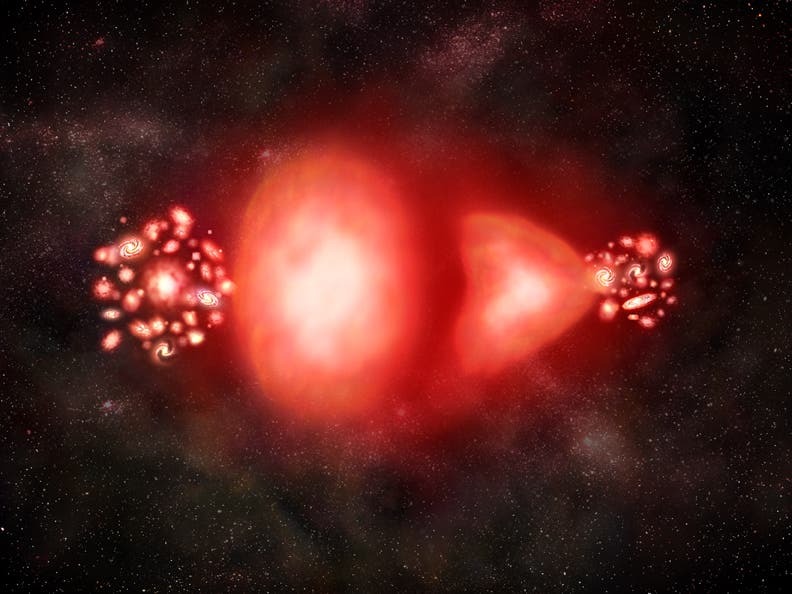 This discovery has wide ramifications, as a cosmological magnetic field could play an important role in the formation of the first stars and could seed the stronger field seen in galaxies and clusters of galaxies in the present day.